By Mike Smith: Luis ‘King Kong’ Ortiz (30-1, 26 KOs) will be fighting on March 2 against heavyweight contender Christian Hammer (24-5, 14 KOs) on the undercard of Erislandy Lara vs. Brian Castano at the Barclays Center in Brooklyn, New York. This is not the fight that the 39-year-old Ortiz wanted. He was hoping to get a fight against the highly rated Dillian Whyte, but there wasn’t any interest from the British fighter, who chose to fight journeyman Dereck Chisora last month on December 22. The fight that Ortiz really wants is a rematch with Deontay Wilder. Ortiz is rated #2 by the World Boxing Council. If he can take Hammer’s scalp on March 2, it could move him into the #1 spot. The WBC has tried to get Dillian Whyte to fight Ortiz, but he wants no part of an eliminator. That could mean that Whyte will get dropped to a lower ranking at some point. However, Whyte is promoted by Matchroom Boxing promoter Eddie Hearn, who is a popular promoter. It’s possible the WBC will leave Whyte in place at #1 with their organization, even though he’s not trying hard to get a fight against Wilder. Whyte’s focus is going after IBF/WBA/WBO champion Anthony Joshua. “I love fighting in that place, because you feel a unique energy and I eat the fire of that audience,” said Ortiz to elnuevoherald.com. “There I was very close to becoming a champion… Very few want to get in the ring with King Kong. I hope that life and God give me the opportunity of revenge,” Ortiz said in talking about wanting to get revenge against Wilder. Ortiz is considered the boogeyman in the heavyweight division. The talented Cuban Ortiz is a fighter that the other top contenders and champions don’t want to fight. Even when they say that they do want to fight him, their actions speak louder than words. Ortiz finds himself avoided every time by the top dogs. The only top heavyweight with courage enough to fight ‘King Kong’ Ortiz was World Boxing Council heavyweight champion Deontay ‘The Bronze Bomber’ Wilder, who came close to being knocked out last March. Ortiz has Wilder within an eyelash of being knocked out in round seven of that clash. Wilder would later come back to stop Ortiz in the 10th round after the Cuban talent gassed out. READ Erislandy Lara vs. Brian Castano rematch planned for Aug. or Sept.
Ortiz has come fully back from his loss to Wilder to defeat former heavyweight world title challenger Razcan Cojanu and Travis Kauffman by knockouts. 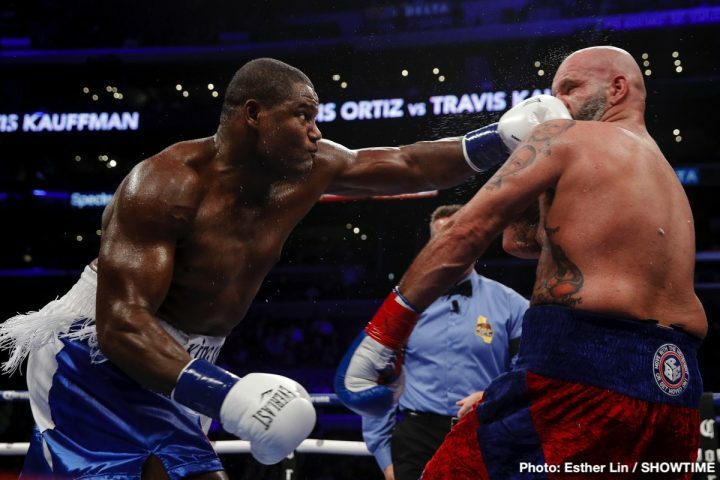 Ortiz had a tough time with Kauffman last December before stopping him in round 10 on the undercard of Wilder vs. Tyson Fury at the Staples Center in Los Angeles, California. Hammer has wins over David Price, Erkan Teper, Michael Sprott, Kevin Johnson and Leif Larsen. Hammer’s losses have come against Tyson Fury, Mariusz Wach, Taras Bidenko, Alexander Povetkin and Robert Gregor. Hammer is a good heavyweight. He just lacks the power to get the job done against the better heavyweights in the division. If he could punch a little harder, he would be a real problem for many of the top guys.